The mighty Mammatus are back! I only just heard this band and really dug some of the stuff on the first CD. The opening track on this new one is part 3 of the Dragon of the Deep Saga and begins with some riffs that remind me of Colour Haze and Causa Sui but then the band just totally flips out at the end like Acid Mothers Temple, before it gets much slower, more stoned with vocals a lot like some of the YOB stuff. Pierce the Darkness is like a psych version of the Sword to start out but goes into like old school guitar psych like live On Trial meets Sundial, before it escapes into a calm ocean of sound and some organ as well. The Changing Wind is a acoustic piece that starts with some disturbing samples but has a nice vibe to it and some flute. 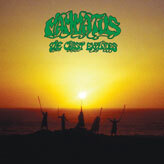 The CD ends with the title track, The Coast Explodes and is another long adventure. Slow and stoned.. Cool stuff.